Chrome — officially Google Chrome — is the free web browser created by Google, Inc. Although QuickBooks Online (QBO) and QuickBooks Online Accountant (QBOA) work in the Chrome, Firefox, Safari, and Internet Explorer browsers, both products work best in Chrome. 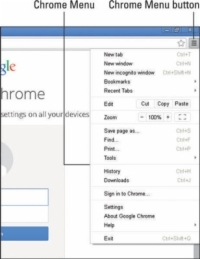 1If you don’t already have Chrome installed on your computer, you can download and install Chrome. 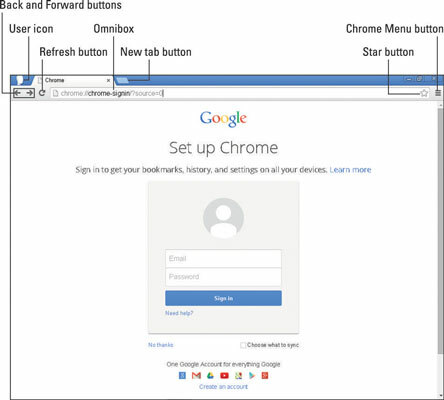 The figure shows how Chrome looks immediately after you install and open it. 2The icon in the upper left corner of the screen represents a Chrome user, and the icon appears only after you create a user. In Chrome, you can set up multiple users, each of whom can have different Chrome settings. In this way, each person using Chrome on a single computer can customize the program, saving his or her own bookmarks, passwords, and more. 3You can open Chrome more than once to view multiple web pages — a process called opening a new window. To open a new window, first open Chrome. Then, press Ctrl+N, and a second instance of the Chrome browser appears, displaying shortcuts to the sites you have visited most often. Also notice that two buttons for Chrome appear in the Windows taskbar. 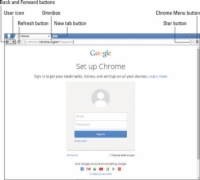 4Chrome refers to the text box at the top of the browser as the Omnibox because it’s a multi-purpose box. To visit a web page, type the address of the web page into the Omnibox and either press Enter or click the Refresh button. After you’ve visited a few websites, you can click the Back and Forward buttons to revisit pages you have recently visited in the order you visited them. 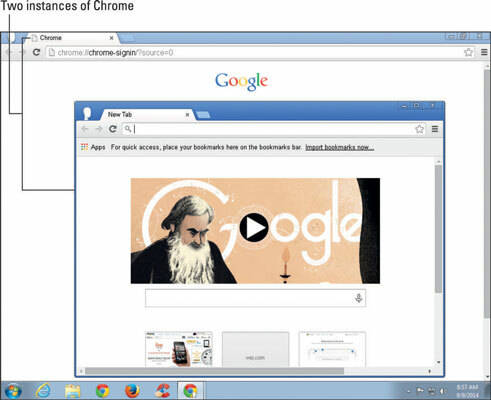 5Chrome uses the Omnibox to combine the functions of navigating to websites and searching the Internet. You can type a search term into the Omnibox, and as you type, suggestions driven by Google’s search technology appear. You can then click a suggestion to navigate to the associated Google search page or web page. 6You can easily save the web address of a site you visit frequently so that you don’t have to type the address each time you want to visit the site. In Chrome, saving a web address is called bookmarking, and you click the star to create a bookmark for the web page you are currently viewing. 7You can click the Chrome Menu button to view a series of commands that help you work in Chrome. There are a lot of options available to you on the Chrome Menu. 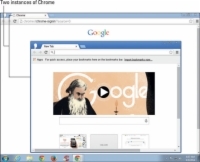 For example, if you want to see how your web browsing affects your computer’s use of memory, you can open the Google Chrome Task Manager from the Tools submenu. 8You don’t have to sign in to use Chrome. In particular, you don’t need to sign in to Chrome to use QBO or QBOA. That said, why sign in? If you sign in, bookmarks and passwords you save, browsing history, and settings are saved to the cloud. 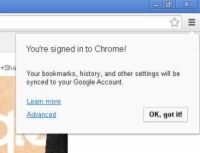 You can then sign in to Chrome on a different computer and use all your settings from any computer. 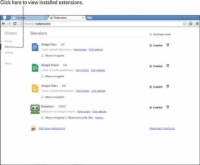 9You can obtain web apps, plug-ins, and extensions from the Chrome Web Store. Web apps you install should appear on the New Tab page, from which you can launch them. You also can remove a web app by right-clicking it on the New Tab page and then clicking Remove from Chrome. Extensions run by default when you open Chrome. 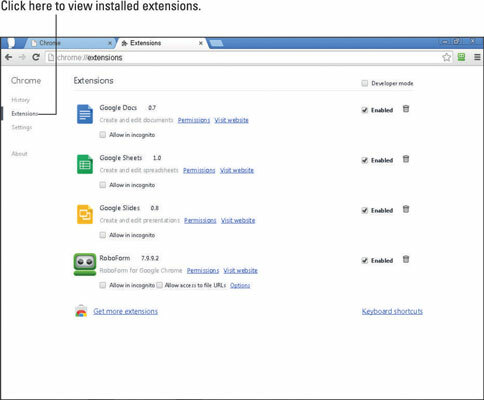 You can view a list of installed extensions from the Settings page. Choose Chrome Menu→Settings. Then, on the left side of the Settings page, click Extensions. 10You can use themes to change the appearance of Chrome. Themes can change the color of the Chrome window, or they can add background pictures to the entire browser. You can find available themes in the Chrome Web Store; in the navigation pane that runs down the left side of the Chrome Web Store page, click Themes to preview available themes. If you install a theme and then later change your mind about using it, choose Chrome Menu→Settings. On the Settings page, in the Appearance section, click Reset to default theme.